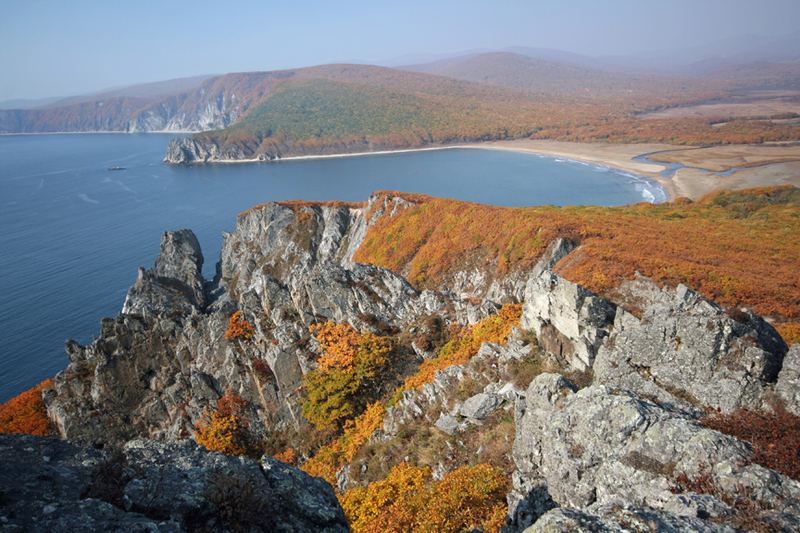 A dense carpet of stunted Mongolian oak gives way to cliff and then to ocean in the Sikhote-Alin Biosphere Reserve in Russia. Languid waves massage the sands of Khuntami Bay in the distance, while somewhere inland a wildfire smolders and pushes an ashy haze towards the Sea of Japan. Up here, perched on a cathedral of rock a hundred meters above the ocean surface, the air is filled with the insect-like twitters of Pacific swifts; funnels of them that lance past on invisible currents of cool ocean breeze. On the cliff face, flashes of dark fur blend with the grey of the rock; these are long-tailed gorals—stocky and goat-like creatures that wisely take refuge here from the Amur tigers, Eurasian lynx, and occasional wolves that pace the game trails along the cliff’s crest. Far below, at the water, Temminck’s and pelagic cormorants huddle on guano-stained crags and unfurl their damp wings deferentially to the sun. The Khuntami cliffs stand tall and imposing; like a sentinel guarding this place where nature remains wild.